Steven McRae. Source: ROH © Copyright belongs to its respective owners. The Royal Ballet’s newest Principal dancer, aussie Steven McRae, charmed the hearts of these Bag Ladies since his first appearances in Covent Garden. At just 23, he has climbed through the ranks and made an impact on every single role he has been cast on. 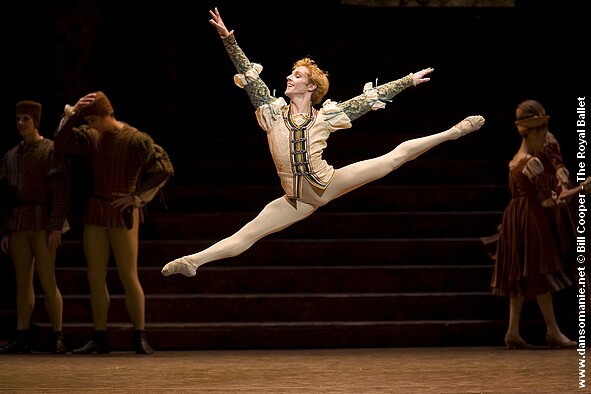 From his debut as one of the side soloists in Ashton’s demanding Symphonic Variations, his first big role and his outstanding Spirit of Fire, in Christopher Wheeldon’s re-reading of Homage to the Queen (Fire) to his unforgettably boyish Romeo opposite Alina Cojocaru’s Juliet, this strawberry blonde dancer has more than justified his fast rise. His undeniable technical abilities to spin multiple, fast and very centered turns, soar high and “freeze frame” in the air, as well as his inherent musicality and charm are guaranteed to dazzle audiences and it seemed clear from the candid (some would say downright bold, see first video link below) way he spoke about his ambitions that he was never going to be a happy camper in the corps de ballet where he first started. As we look forward to Steven’s first season as a Principal dancer, here are some interesting facts & web notes on him. Born in Sydney (Plumpton, in the Western Suburbs). Like many men in the dance world, he started ballet at 7 years old because of his sister. He also did gymnastics, jazz and tap dancing. He won the gold medal of the Genée Competition in Sydney (performing Danses Concertantes) and scooped the first prize in 2003’s Prix de Lausanne, despite not having started full time ballet much long before the competition. He joined the Royal Ballet School, where he studied for three years, before finally being offered a contract with the company. His first role was in the triple bill “The Wedding Bouquet/Requiem/Les Noces”. His first big break was in Symphonic Variations, sharing the stage with Johan Kobborg and Federico Bonelli. He has had work created on him by Wheeldon, McGregor and Marriott, among others. Steven works closely with long time principals Johan Kobborg & Alina Cojocaru, having danced important roles in Johan’s productions of La Sylphide (as Gurn) and in Napoli Divertissements and more recently creating a role alongside Sergei Polunin and Cojocaru in Kobborg’s short virtuoso piece Les Lutins. At the time of his debut in Romeo & Juliet the press reported that it was Alina who had asked for him to partner her when Kobborg became injured. Steven partnered Alina in the pas de deux of Balanchine’s Stars and Stripes at the ROH’s World Stage gala in Nov 2007, having also travelled to Tokyo with her that autumn to stand in for Kobborg in Ashton‘s The Dream (debuting as Oberon). They are due to reprise their partnership in Japan later this year dancing in The Nutcracker. Steven is ambitious, competitive and a perfectionist, placing major importance on developing his roles. His most embarrassing moment occurred when his trousers split open during his first Fille Mal Gardée. He is also a grateful student, taking time to visit his old ballet school whenever he visits Australia (usually once a year) where he teaches and mentors new generations of dancers. His dream role is Des Grieux in MacMillan’s Manon. In the Swan Lake pas de trois, together with Laura Morera and Yuhui Choe [link]. What the future holds for Steven McRae I dare not guess, but if he is not spoiled by too much – or too little – attention, he must surely have a splendid career. His dancing was exceptional in grace and security. Clement Crisp at the Financial Times [link]. Although only 21, McRae is one of the most technically accomplished dancers in the Royal Ballet and he brought an elegance and lightness of touch to sequences that have undone much more experienced performers. Luke Jennings at The Observer [link]. McRae is bright, brilliant-cut in technique, ardent in shaping a step or a phrase, and the role is his – and handsomely so. Clement Crisp at the Financial Times [link]. Public Booking opens July 14th. Friends of Covent Garden priority booking period currently open. of writing is genuinely a pleasant post, keep it up.